Handmade brocade silk cushion cover in vibrant colors that will compliment both contemporary and traditional room settings. With attractive motifs all over, this cushion cover will get your attention every time you are in your living room. 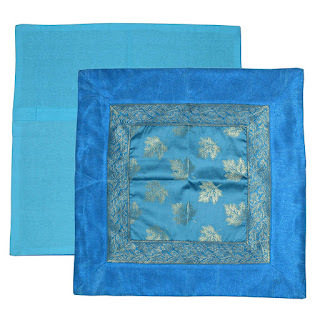 Made of brocade silk in front side and cotton or polyester on back side made them very easy to maintain and has been designed to bring elegant feel to your home. Brocades are textiles woven with warp and weft threads of different colors and often of different materials. The Varanasi brocades are woven in silk, with profuse use of metal threads borders. The weavers are known as karigars, which means artists, who weave in workshops called karkhanas, Almost every inch of space in the karkhana is taken up by looms, and above each loom hangs a crowded arrangement of strings leading down to the room heddles. The zari thread, known as kalabattun, consists of finely drawn gold, silver or base metal thread, wound round a silk thread. The most famed of Varanasi brocaded textile is called kinkhab woven with a coarse but durable silk known as mukta, which is heavy enough to take brocading with silver or gold thread. The silk-and-zari-work brocade of lighter material and less heavier ornamentation is known as bafta and the brocade without any metal thread work is known as amaru. Benaras brocades are woven on pitlooms.